“Shall the charter of the Borough of Highlands governed by Small Municipality Plan B be amended, as permitted under that plan, to provide for the holding of regular (i.e. 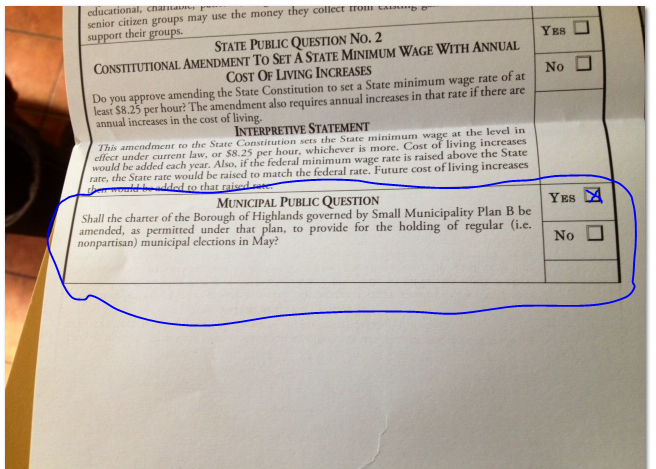 nonpartisan) municipal elections in May?” – With a Yes/No check box to the right of it. What this means is, Highlands will switch to a Non-Partisan government and the Republican/Democrat titles will no longer be relevant. The party heads will no longer gets to choose who gets to run in Highlands, we the residents do. It will also push the “municipal elections” to May. We the people, for the people, it’s time!!! !